Sure the "Full Metal Jacket" parody has been done before, but I think it's now safe to say Bigg Stank Dogg has done it better. In addition to the rendering of the helmet, the incorporation of the game's hexagonal imagery and the play on the title take it to the next level. Everything about this design not only makes me want this t shirt, but is also making me yearn for the fast-paced, first-person shooter "Titanfall" even more. 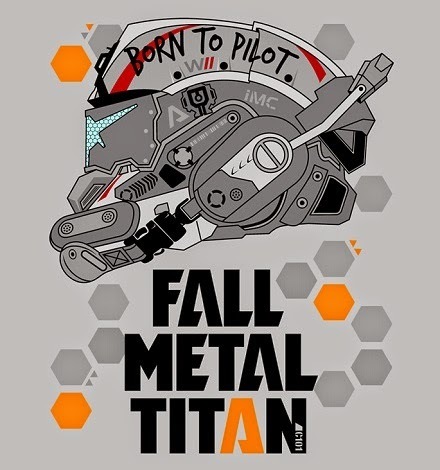 You can find "Fall Metal Titan" under the "TV" tab at ShirtPunch! until 11:59pm EST tonight, 06.08.14. UPDATE 06.09.14 Now available for $20 in Bigg Stank Dogg's TeePublic store.